Terry Elgin, is now Terry Swank. After graduating from Ellet, Terry went to Akron U, but she left town in 1977, and finished up at Ohio University, with a BS and Masters, in Early Childhood. She works in the field of Early Childhood Education. Terry is Assistant Director of the Ohio University Child Development Center. She's involved in the daily operations (enrollment, orientations, tours etc) of the Center and teaches and supervises the Professional Interns (student teachers). "We are a nature based school which provides adult students (interns) young children and families experiences, in nature. We have a children's garden which allows the children to have daily interaction with the natural world. We are also located on "the Ridges" which is an old working farm, formally called the 'Athens Lunatic Asylum'." Terry goes on to say, "This farm provided opportunities for mental health patients to work in the fields, horse barn, and dairy while they were getting treatment, many years ago. But, this all changed about 50 years ago when the mental health field went in another direction. At that time the old Victorian buildings sat empty until Ohio University paid $1.00 for ALL the buildings and land. My school is located in the old horse barn. We LOVE it here because we have all the land to explore, and it allows young children daily nature experiences." Years ago, Terry moved to Plymouth, Ohio and then to Athens, where she still lives, and is married to Alan Swank. Daughter Lindsey, was born in 1981. She graduated from Marietta College and got her Masters from Ohio University. Lindsey is a yearbook rep for Balfour (yearbooks). She works in the Southeastern Ohio and Columbus area, and lives just two doors up from us. Their son, Ryan, was born in 1984. He is an Ohio University grad and went The Culinary Institute of America (CIA) in Hyde Park, NY to become a chef. He worked in Aspen, CO for two years, and then moved to Cincinnati, where he works at "Metropole", inside Cincinnati's '21c Museum Hotel'. Terry now has three granddaughters: Ava (b. 2009), Emma (b. 2011), and Olivia (b 2014). In Terry's free time she enjoys gardening, reading, cooking, walking. Spending time with family and friends is a favorite pasttime, and she LOVES to travel. She and Alan enjoy vacationing in Ashville, NC, and Portland, Maine. They really love going to Kure Beach, NC, (FYI: Kure Beach is home to the oldest fishing pier on the Atlantic coast). Terry says, "Life it good. We are lucky to have our health, and loved ones near!!!!" I knew I was grown up, when............ "my daughter had children." If I had it to do all over again, I would ".............not change a thing." I hope I never have to............... "do the same thing, everyday." I would give ANYthing to meet............. "my mother's father(not sure about anything)"
The worst time of my life was..................." taking care of my sick father before he died, (but also very lucky to be able to do be there, for him)." I've never been able to................. "skate like I want to"
The Best time of my life................. "is now!" People who knew me in HS thought..............."I was shy." If I've learned one thing in life............... "it's to be grateful for each day." The BEST part of my job is............... "working with children, students, and families.............."
The WORST part of my job is................. "not being able to serve all the families that need, and want, quality childcare." A really great evening for me is............. "dinner with family and friends." One thing I can't stand in people is................. "when they are cheap!!" 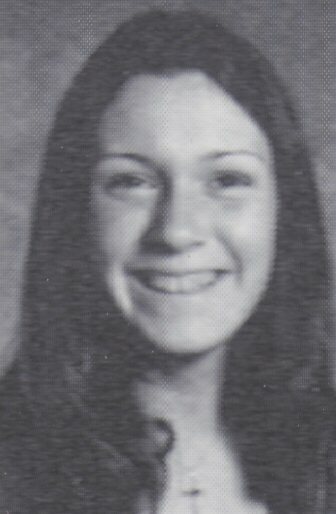 and, finally: My favorite performers are:............ "James Taylor, Tommy Emmanuel, Dar Williams, Jackson Browne"
Well, there she is..... Ellet High School Class of 1974's Terry Elgin.